Currently, Canadian crude oil is transported from Canada to the Texas refineries via the Burlington Northern Santa Fe Railroad (BNSF). BNSF is owned by Berkshire Hathaway, and the controlling owner of Berkshire Hathaway is Warren Buffett who is one of the wealthiest men in America and the world. As our friends at “Godfather Politics” noted BNSF Railroad makes about $30 for every barrel of Canadian crude oil they transport to the Texas refineries for an annual income of around $2 billion. If the Keystone XL Pipeline was approved and completed, it is estimated that it would cost only about $10 per barrel to transport the crude oil from Canada to Texas. If that happened, Buffett’s railroad stands to lose nearly $2 billion of annual revenue. $2 billion is not chicken scratch even to Warren Buffett; it is a huge wealth transfer from Buffett’s Berkshire Hathaway company to the shareholders of the Keystone XL pipeline. But Berkshire Hathaway’s energy-related crony capitalism doesn’t stop there. As former Congressman Ernest Istook of Oklahoma observed in an interview with NewsMax, of the $40 billion annually doled out to various green energy incentives, grants and loans, one of the biggest magnets for public funds is a wind energy tax credit first enacted in 1992. "For every megawatt hour that [producers] generate through wind energy, they get $23 from the U.S. Treasury," he Istook told NewsMax. "I want to give you a quote, though, from one individual who was a major wind energy investor and getting a lot of these tax benefits: Warren Buffett," said Istook, citing the Nebraska-based billionaire investment guru. "These are his words, not mine: 'We get a tax credit if we build a lot of wind farms. That's the only reason to build them. They don't make sense without the tax credit.' Those are Warren Buffett's words," said Istook. "The people that are making this investment recognize that unless they can get these crony capitalism dollars, it's a bad investment," he said. "But government is paying them to do that. It's paying some people to get rich at our expense while our utility bills go up." Berkshire Hathaway is also one of the biggest insurers in the world, and guess why billions of dollars in life insurance are purchased every year? As a hedge against prospective estate taxes, that’s why. In fiscal year 2010, the IRS collected a net $18.9 billion in estate and gift taxes – this represents a huge market for insurance. And some 70 or the companies owned in part or in whole by Berkshire Hathaway are insurance-related, although to all of them are in the life insurance business. So while Warren Buffett says he supports the estate tax and sounds like a straight shooting guy who believes in the Obama-Democratic Party goals of wealth redistribution through the estate tax, he is actually profiting from the $18 billion-plus potential market for life insurance hedges against the policies he supports. 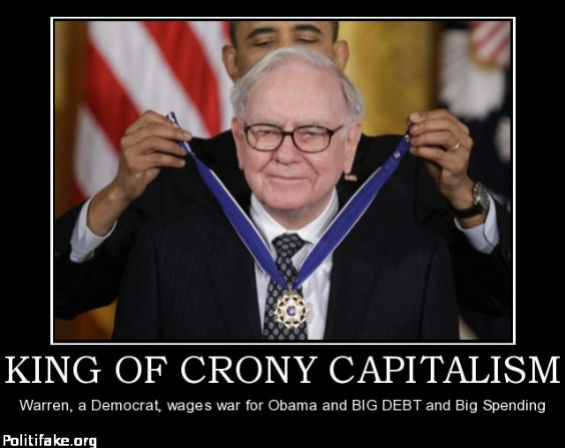 Berkshire Hathaway has benefited from any number of crony capitalist deals with Democrats and the Obama administration. From stopping safety upgrades to railroad tank cars, to scotching the Keystone XL pipeline, to Buffett’s strange support for the estate tax that he will never pay (because a huge portion of his assets are going into a trust managed by fellow estate tax supporter Bill Gates) to expensive “green energy” investments that are nothing more than raids on the U.S. Treasury the “Oracle of Omaha” has made many shrewd investments, and one of the best was Barack Obama. Submitted by joseph.foster on Fri, 12/19/2014 - 15:41. I wonder if Buffett ever read Atlas Shrugged. If he did I am sure that he would recognize himself as being one of the central characters that Rand was warning us against. You know! If you can't make your money by the sweat of your brow or your own innate intelligence, then you might as well become a crony-capitalist like this poster child representing the worst of both government and lazy and stupid capitalism!